Many of my friends here in Huntington Beach, CA grew up together. They have known each other for years and many had lived together under the same roof in a particular townhouse on Delaware Street, often affectionately referred to as the “Delaware House”. I currently live in the Delaware House, and since moving in almost three years ago, I have been introduced to many of the customs and traditions that were handed down over generations of residents of this house. One such tradition is the birthday Donkey Balls shot. Rumor has it that the Donkey Balls tradition began a few years ago while celebrating a birthday out in the town. A few guys decided to buy the birthday boy a shot. But in a weird sense of camaraderie and male bonding, they decided that the shot must not only be the strongest one imaginable, but it should also taste terrible and be something so unique that you cannot find off a menu. Thus the Donkey Balls Shot was born. 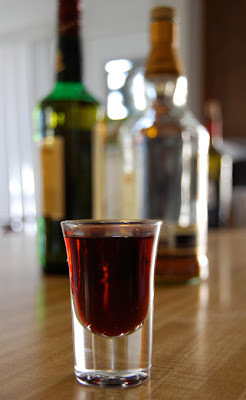 A Donkey Balls shot is basically a variation of a Three Wise Men shot – with a splash of Jäger. That’s right. The recipe consists of equal parts Jack Daniels Whiskey, Jim Bean Bourbon and Johnny Walker Scotch Whiskey, and topped off with Jägermeister. Lately, a south of the border version of the Donkey Balls has also made an appearance. In this version, one of the whiskeys is substituted with José Cuervo Tequila. I’m not sure who came up with the name “Donkey Balls”, but it pretty much sums up the taste of this shot: disgusting! Somehow in spite of it all, the tradition of the birthday Donkey Balls shot has stuck. I had the pleasure torture of a first hand introduction to this shot a few months ago while celebrating my birthday. While many more after me will continue to experience this tradition, just know that no matter where your dinner lands, or how your head feels the next day, you had a wonderful time celebrating your birthday with the boys of the Delaware House!